I’m closing out Granny Square Month with a roundup of 15 free crochet patterns for 12” (30.5 cm) squares. These larger motifs are great because you only need to make a few to finish your project, and they can be combined with 4” (3 x 3 layout), 6” (2 x 2 layout), or 8” (3 x 3 layout combined with a 2 x 2 layout for the 12” squares) to create different looks. Coral and Stone Square by Beatrice Ryan Designs: This 3-color square pattern uses one of my favorite stitches, the crossed double crochet. Loopy Flower Square by Stitches n Scraps: This 3-color square pattern includes a video tutorial. Dizzy Corner Square by Mamas 2 Hands: This 4-color square pattern includes helpful progress photos. Winter Woods Mitered Square by Fiber Flux: This 4-color square pattern includes a full video tutorial. Ombre Flower Garden Square by The Lavender Chair: This 4-color floral square pattern includes helpful progress photos. Mandala Galaxy Square by The Lavender Chair: This 4-color square pattern includes helpful progress photos. Puff Wheat 12” Afghan Block by Designs by Muggins: This textured square includes instructions for making a larger 14” – 20” pillow cover. Upbeat Simple Square by ELK Studio: This 3-color square uses post stitches to add texture. 12” Football Team Colors Square by Kathy North: This pattern is ideal for making a blanket for your favorite sports fan. Dahlia Bloom Afghan Square by Petals to Picots: This 5-color square pattern includes both written instructions and an international stitch symbol chart. Daisy Afghan Square by Petals to Picots: This 5-color floral square pattern includes both written instructions and an international stitch symbol chart. Box of Color Square by Fiber Flux: This 4-color square pattern includes a video tutorial. Zinnia Square by Little Monkeys Crochet: This pattern includes detailed progress photos. Metamorphosis Square by Cre8tion Crochet: This square is shown worked in 2 colors and in 3 colors. Aubrieta Bloom Afghan Square by Petals to Picots: This 4-color square pattern includes both written instructions and an international stitch symbol chart. Looking for more crochet inspiration? Follow my Crochet Pattern Roundups Board on Pinterest. I mentioned on Wednesday that hexagons are actually my favorite shape for motifs, so I thought today I would share the pattern for the classic Solid Granny Hexagon. This simple motif can be adjusted to your preferred size and joined, or you can just make one huge hexagon as your final project. This post is part of my Granny Square Month series. This would be a great motif to make into a blanket, scarf, shawl. I have several joining tutorials if you decide to make a bunch! Different joins work well for different types of projects, so do a little experimenting and see what works for you. If you make your own Solid Granny Hexagon, I’d love to see it! Share your progress and questions by tagging me on Facebook as @Underground Crafter, Instragram as @ucrafter, or Twitter as @ucrafter. You can also share a picture in the Underground Crafters Facebook group. Sign up for my weekly newsletter and get a coupon code for your choice of one of my premium patterns and other subscriber goodies. Plus, you’ll never miss one of my free patterns again! Add the Solid Granny Hexagon to your Ravelry favorites or queue. This classic pattern can be worked as a motif in your preferred size and then joined, or crocheted as one large hexagon as your final project. Adjustable. Pictured sample measures 6.5” (16.5 cm) across flat edges. 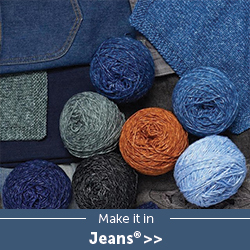 Lion Brand Jeans yarn (100% acrylic, 3.5 oz/100 g/246 yd/225 m) – 1 skein in 150 Vintage, or approximately 246 yd (225 m) in any medium weight yarn. Through Round 6 in pattern = 6.5” (16.5 cm) across flat edges. Exact gauge is not critical for this project. Motif is worked in the round with the right side facing. This version is worked in one color. To change color, fasten off at end of Rnd. Join next color with sl st to any ch-2 sp, then follow instructions for next Rnd. To adjust size, add or remove repeats of Rnd 3. © 2018 by Marie Segares (Underground Crafter). This pattern is for personal use only. You may use the pattern to make unlimited items for yourself, for charity, or to give as gifts. You may sell items you personally make by hand from this pattern. Do not violate Marie’s copyright by distributing this pattern or the photos in any form, including but not limited to scanning, photocopying, emailing, or posting on a website or internet discussion group. If you want to share the pattern, point your friends to this link: https://undergroundcrafter.com/blog/2018/06/29/crochet-pattern-solid-granny-hexagon. Thanks for supporting indie designers! Borders can pull a motif blanket pattern together and add the finishing touches that make a pattern really wow. In today’s Granny Square Month post, I’m sharing twenty-seven free crochet border patterns for your next granny square (or hexagon) blanket! Border #17 by Edie Eckman: This three-round, cluster stitch border includes both written instructions and an international stitch symbol chart. This pattern was shared on ELK Studio as part of the Every Which Way Crochet Borders blog tour. The Final Frontier border by Designs by Muggins: This border includes seven-, eight-, and eleven-row variations. Granny Square Border by Cherry Heart: This border pattern is written in UK pattern abbreviations and includes detailed progress photos. Banksia Border by Look At What I Made: This pattern includes written instructions, progress pictures, and an international stitch symbol chart. It has been translated into eight languages. Granny Hexagon Edging by Petals to Picots: This pattern is designed to fill in between these Granny Hexagons and also to add a decorative border. Rose Border by Look At What I Made: This pattern includes both tutorial and progress pictures and was designed for the Lydia Blanket. How To Crochet a Border on a Blanket by AllFreeCrochetAfghanPatterns: This tutorial includes two border options, an easy Reverse Single Crochet Edging and an Intermediate Princess Tiara Edging. Border #32 by Edie Eckman: This lacy, three-round border includes written instructions and an international stitch symbol chart. This pattern was shared on Underground Crafter as part of the Every Which Way Crochet Borders blog tour. Cluster Lace Edging by Kim Guzman: This lacy border was used in the Lunar Crossing Poncho. Zig-Zag Blanket Border by Lilla Björn Crochet: This 10-round border was designed for the Nuts About Squares Crochet Along with It’s all in a Nutshell. This pattern includes a video tutorial. Popcorn Border by Moogly: This border adds great texture to any project. It was designed for the 2016 Moogly Afghan Crochet Along. Crossed Double Crochet Border by Mama’s Stitchery Projects: This pattern uses one of my favorite crochet stitch patterns. Big Leaf Edging by Cypress Textiles: This seven-round edging includes progress pictures, written instructions, and an international stitch symbol chart. Canada Goose Border by Designs by Muggins: This two-round border is described as a “yarn hog,” but it has a great texture. Border #52 by Edie Eckman: This four-round border gives the look of little circles and includes both written instructions and an international stitch symbol chart. This pattern was shared on Felted Button as part of the Every Which Way Crochet Borders blog tour. Granny Square Edging/Border by Petals to Picots: This simple granny square inspired edging includes both written instructions and an international stitch symbol chart. Quick and Easy Blanket Edgings by Petals to Picots: These three border patterns can be added to fabric blankets and include a tutorial for preparing the fabric for a crochet edging. Windows Border by Moogly: This border includes instructions for working flat or in the round. It was designed for the 2017 Moogly Afghan Crochet Along. Pumpkin Patch Edging by Fiber Flux: This pattern includes both photo and video tutorials. Vibrantly Vintage Edging by Cypress Textiles: This pattern is designed for the Vibrant Vintage Blanket. Checker Edging by Cypress Textiles: This five-round border was used in the Gumball Blanket (a premium pattern for sale on Ravelry here). Border #71 by Edie Eckman: This lacy, six-round border includes written instructions and an international stitch symbol chart. This pattern was shared on Moogly as part of the Every Which Way Crochet Borders blog tour. Candy Cane Border by Repeat Crafter Me: This two-color border includes a video tutorial. Cone border by Designs by Muggins: This border includes feminine and masculine variations. Still looking for more border ideas? 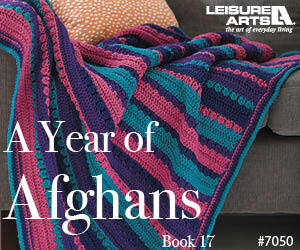 Try 21 Crochet Afghan Borders You Need to See on AllFreeCrochetAfghanPatterns. Hexagons are one of my favorite shapes. Today’s Granny Square Month post is a roundup of twelve free crochet hexagon patterns, including motifs, blankets, a soccer ball, and a rug. Post Stitch Hexagon by Underground Crafter: This textured variation on the traditional hexagon motif would make a great scrubby or blanket block. Flower to Hexagon Granny by Jessie At Home: This floral hexagon pattern includes several linked video tutorials. Little Hexagon Blanket by Marianna’s Lazy Daisy Days: This pattern uses a simple, two color hexagon with an easy border. Popcorn Flower Hexagon by Zooty Owl: This textured hexagon is a great scrap buster pattern. Hexagon Baby Blanket by Meladora’s Creations: This blanket features a ruffled border and includes both video and photo tutorials. Sunburst Hexagon by Persia Lou: This pattern is part of a hexagon crochet along and links to six more free crochet patterns. Crab Hexagon by Trifles N Treasures: This pattern is one of the motifs featured in the Ocean Hexi Beach Bag. Quilt-Inspired Star Hexagon by B.Hooked: This motif is made up of diamonds and is linked to a video tutorial. Soccer Ball by Repeat Crafter Me: This makes a great pillow or indoor toy for your favorite soccer fan and is made with hexagons and pentagons. Traditional Hexagon Motif by Moogly: This pattern for a classic motif features video tutorials. There is also the matching Traditional Half Hexagon Motif. Easy Hexagon Rug by Mary Lamb Becker via FaveCrafts: This rug is made from one large hexagon and includes appliqued motifs on the border. Nouveau Chic Granny Throw by Ellen Gormley via FaveCrafts: This blanket combines squares, hexagons, and octagons. Need more hexagon inspiration? Check out this roundup of 16 Free Crochet Hexagon Patterns and this roundup of 20+ Free Crochet Patterns for Hexagon Motifs! It’s no secret that I love using asymmetry in my designs. I’m sharing the free crochet pattern for the Granny Chevron Wrap, a rippled rectangular wrap that features stripes and color blocking to make a dramatic statement. This post is part of my 30-day celebration of Granny Square Month. If you follow me on Instagram, you may have seen this progress photo a few weeks back. I was just at the very beginning of the Granny Chevron Wrap journey. I wanted to design a pattern for Granny Square Month that could be worked in one piece (to satisfy those many crocheters who like the look of the granny stitch but aren’t fans of seaming). If you also aren’t a fan of weaving in ends, feel free to make your version in one color. I like the way this wrap has two sides (two personalities?) to it. There’s the light and cheerful striped side, and there’s the dark and subtle solid side. As you can see, it’s a very versatile color! If you make your own Granny Chevron Wrap, I’d love to see it! Share your progress and questions by tagging me on Facebook as @Underground Crafter, Instragram as @ucrafter, or Twitter as @ucrafter. You can also share a picture in the Underground Crafters Facebook group. Sign up for my weekly newsletter and get a coupon code for your choice of one of my premium patterns and other subscriber goodies. Plus, you’ll never miss one of my free patterns again! Add the Granny Chevron Wrap to your Ravelry favorites or queue. 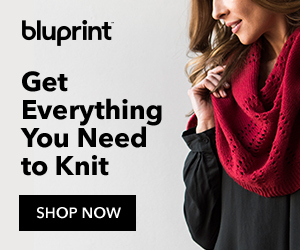 This rippled, rectangular granny stitch shawl is long enough to wrap yourself in comfort. It can be worn as a shawl or wide scarf. The combination of stripes and color blocking make a dramatic statement piece. The simple, one row repeat pattern makes this a perfect prayer shawl or mindful crochet project. Adult: 14” (35.5 cm) width x 62.5” (159 cm) length. Lion Brand Heartland yarn (100% acrylic, 5 oz/142 g, 251 yd/230 m) – 2 skeins ea in 156 Guadalupe Mountains (CA) and 105 Glacier Bay (CB), and 1 skein in 98 Acadia (CB), or approximately 305 yd (279 m) in CA, 251 yd (230 m) in CB, and 470 yd (430 m) in CC in any medium weight yarn. Width in pattern = 14” (35.5 cm) across. Exact gauge is not critical for this project. cl – cluster – [Yo, insert hook in st, yo and draw up a loop, yo and draw through 2 loops] 3 times in same st, yo and draw through all 4 loops on hook. A helpful video tutorial for this stitch by New Stitch A Day is available here. For this pattern, do not “secure it” with a chain as advised in the video. () Instructions within parenthesis are worked into same stitch or space. Starting in Row 2, stitches are worked into spaces between 3-st groups. With CA, ch 71 (or any multiple of 23 sts, + 25 sts). Row 2: Turn, ch 3, sk first st and first sp, 3 dc in ea of next 3 sp between 3-st groups, (3 dc, ch 3, 3 dc) in next ch-3 sp, *3 dc in ea of next 2 sp between 3-st groups, cl in next sp, sk sp between cl from previous row, cl in next sp, 3 dc in ea of next 2 sp between 3-st groups, (3 dc, ch 3, 3 dc) in next ch-3 sp; rep from * across to last 4 sp, 3 dc in ea of next 3 sp between 3-st groups, dc in sp between last 3-dc group and last dc. Rows 3-5: Rep Row 2, 3 times, changing to CB in last yo of final dc at end of Row 5. Fasten off CA. Rows 6-10: Rep Row 2, 5 times, changing to CA in last yo of final dc at end of Row 10. Fasten off CB. Rows 11-15: Rep Row 2, 5 times, changing to CB in last yo of final dc at end of Row 15. Fasten off CA. Rows 16-45: Rep Rows 6-15, 3 times, or until wrap measures approximately 32” (81.5 cm) long (or about half of desired length), ending after Row 15 but changing to CC in last yo of final dc at end of Row 45. Rows 46-85: Rep Row 2, 40 times, or until wrap measures about 62.5” (159 cm), or desired length. Fasten off CC. © 2018 by Marie Segares (Underground Crafter). This pattern is for personal use only. You may use the pattern to make unlimited items for yourself, for charity, or to give as gifts. You may sell items you personally make by hand from this pattern. Do not violate Marie’s copyright by distributing this pattern or the photos in any form, including but not limited to scanning, photocopying, emailing, or posting on a website or internet discussion group. If you want to share the pattern, point your friends to this link: https://undergroundcrafter.com/blog/2018/06/26/crochet-pattern-granny-chevron-wrap. Thanks for supporting indie designers!